The Vietnamese Government and people appreciate Ireland’s official development assistance, which has contributed significantly to socio-economic development in the Southeast Asian country. 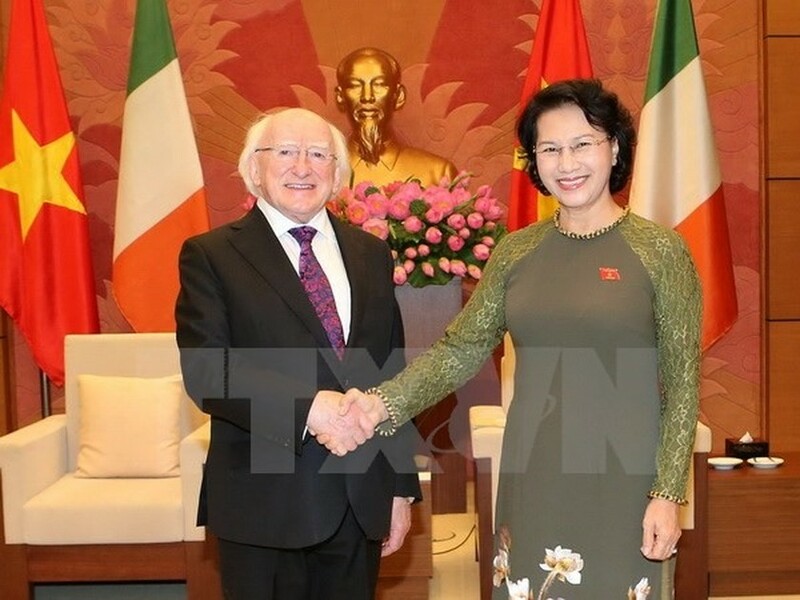 National Assembly Chairwoman Nguyễn Thị Kim Ngân made the statement during her meeting with Irish President Michael D. Higgins in Hà Nội yesterday. Irish-funded projects are being implemented effectively in Việt Nam, she said, and expressed hope that the ODA will be maintained, particularly in poverty alleviation, climate change adaptation and sustainable development. Ngân hailed Ireland ’s upcoming announcement of a national strategy on development cooperation with Việt Nam for 2017-2020. She requested the support of the Irish President and parliament in accelerating the EU’s signing and ratification of its free trade agreement with Việt Nam. For his part, Higgins said he is honoured to be the first Irish head of state to visit Vietnam, adding that he is confident the visit would boost bilateral friendship and solidarity. Noting Việt Nam’s impressive socio-economic achievements, Higgins lauded the role of the Việt Nam National Assembly in boosting law enforcement, uniting people and meeting their expectations. He spoke highly of Việt Nam’s accomplishments in increasing the participation of women in law-making agencies, which he considered a similarity between the two countries. Underscoring work toward gender equality, he said the Irish international co-operation agency places great stress on improving capacity for women and empowering them. Informing his host about the outcomes of his talks with President Trần Đại Quang, Higgins said both sides agreed that education-training is a focus of bilateral cooperation. He and his Việt Nam counterpart also agreed on a number of measures to help Vietnamese students easily obtain Irish visas. According to the Irish leader, Việt Nam has great potential to contribute to ASEAN’s cultural development, particularly in cinematography.